We have to believe in free will – we have no choice. The 1960s was a good decade, it seems, as in the ’60s Stuart Richman was a founder member of the Liverpool Everyman and Isaac Bashevis Singer wrote his novel A Day of Pleasure. When Richman stumbled across a copy of the book in a Hoylake saleroom he fell in love with the stories it contained and has been crusading to bring them to life for new audiences. 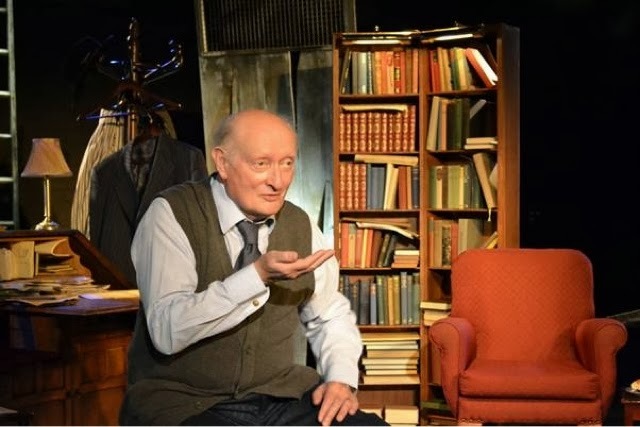 He didn’t originally want to make a play out of it, and so it is with the very minimum of dramaturgy that the book found its way onto the stage of the Playhouse studio, with Stuart Richman portraying the author. We meet Singer in his New York apartment in 1978. He is packing his bag and getting changed as he waits for a taxi for the airport en-route to Stockholm to collect the Nobel Prize for Literature. He muses that here he is, an old Yiddish writer - tomorrow he will be a Nobel Prizewinner and the day after that he will just be an old Yiddish writer again. His mind travels back to his childhood and for the next 90 minutes he relates reminiscences of growing up in Warsaw and memories of his neighbours on Krochmalna Street. The tales he tells serve as modern parables and, like the very best theatre and storytelling, reflect on some of the great truths of life. “Life is God’s novel - let him write it” says Singer, but he provides all the illustrations in this kaleidoscope of a work. Sometimes moving, sometimes wryly humorous, but always compelling – Richman holds the audience in the palm of his hand throughout. I had an uncle who could tell a good tale, in which the line between fact and fiction became distinctly blurred, and there was much of the sense of sitting round the fire sharing tales from the past about this work that took me back to my own childhood. In one story, a man carrying a wardrobe on his back was told that “…come the revolution you won’t be carrying that”. The man’s reply was to wonder whether, after the revolution, the closet would carry itself. I was immediately put in mind of a line being spoken downstairs in the main house in another play, running concurrently, (see “Melody Loses her Mojo”) in which a character says “We can’t all live the dream or there’ll be no-one left to empty the bins”. This serves to highlight for me the many ways in which theatre can continue to find new and different ways of underlining the realities of life. This consummate demonstration of great, old-fashioned storytelling, directed by Neil Sissons, was played out in front of a beautifully detailed set designed by Anna Gooch and it ran in the Playhouse Theatre Studio for four performances only, from 26th to 28th September 2013. Useful Donkey Theatre Company, who produced it, hope to be touring the production in the spring of 2014, so watch out for further opportunities to see it near you.